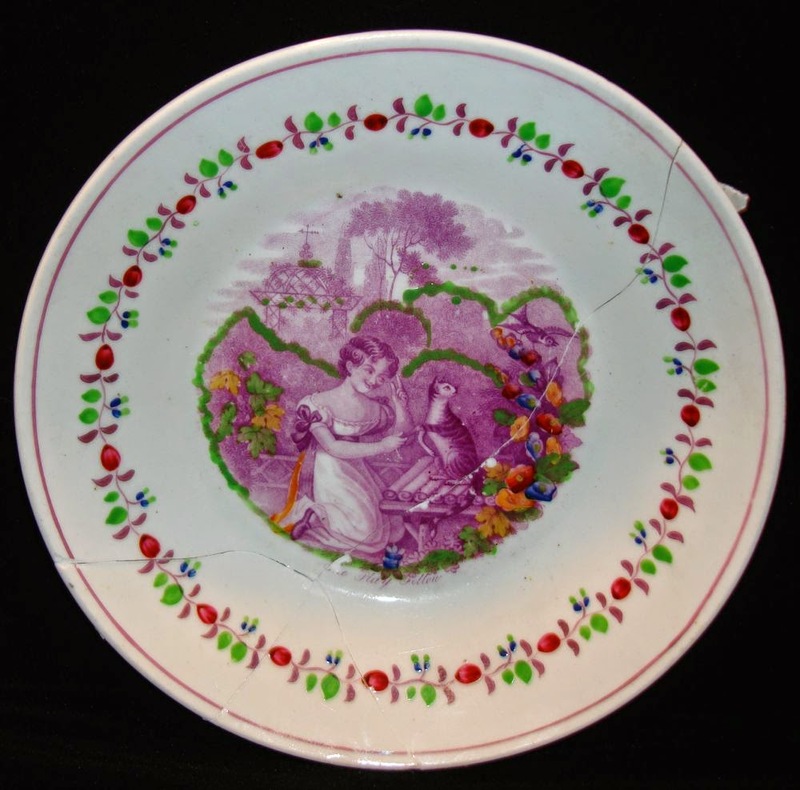 I bought a lovely dish* printed with The Play Fellow, which shows a young girl admonishing her cat who is lusting after a bird. I think a dog would be a better play fellow than a cat. I have lived with cats for nearly 50 years, and I have never had one that I would describe as a play fellow. Perhaps a kitten. 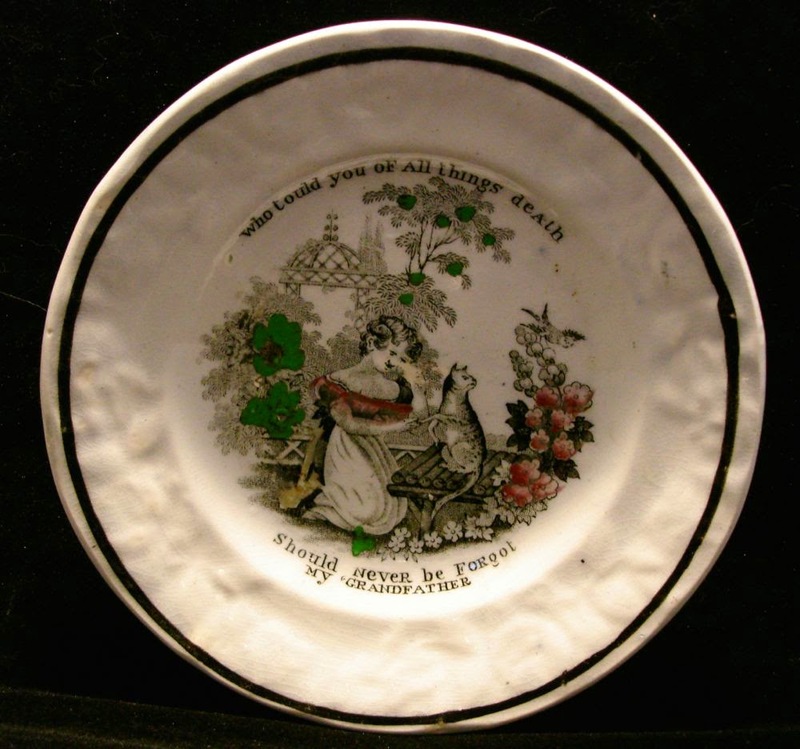 I noticed that a child's plate in my collection was printed with the same pattern, but the text was quite different; "Who tould (sic) you of all things death/Should never be Forgot/My Grandfather." I guess the cat is going to succeed in getting the bird. Thus the warning. The pattern on the 4.5 inch plate is the same as above. The poem My Grandfather is from a picture sheet published by William Darton, Jr., ca. 1812-1815. The poem was written by William Upton. I doubt most twenty-first century parents or grandparents would give a plate with this text to a child. I wrote about inappropriate patterns for children in another blog post as well as for an article for the Transferware Collectors Club Bulletin. See the link here. *You may have noticed that the dish (a large saucer-shaped piece) is broken. It arrived via USPS in four pieces plus flakes. I taped it together. I never throw out pieces of 19th century pottery. Though not exactly playing, we had a lot of fun today introducing my son's girlfriend's Labrador to our neighbour's Norwegian Forest cat (Sheldon!) - the cat was irresistibly drawn to the dog and sat outside wailing for him to be let out. And my friend insists she taught her cat to miaow over twenty words! I guess cats can be play fellows! Mine just seem to sleep. "ARCTIC SCENERY" AND AFRICAN ANIMALS!